A lot of the focus in Northern California over the past two weeks has been on the Oakland Raiders’ decision to trade Khalil Mack. Moving a future Hall of Famer and former NFL Defensive Player of the Year in the height of his career is going to get you thrown into the meat grinder more often than not. 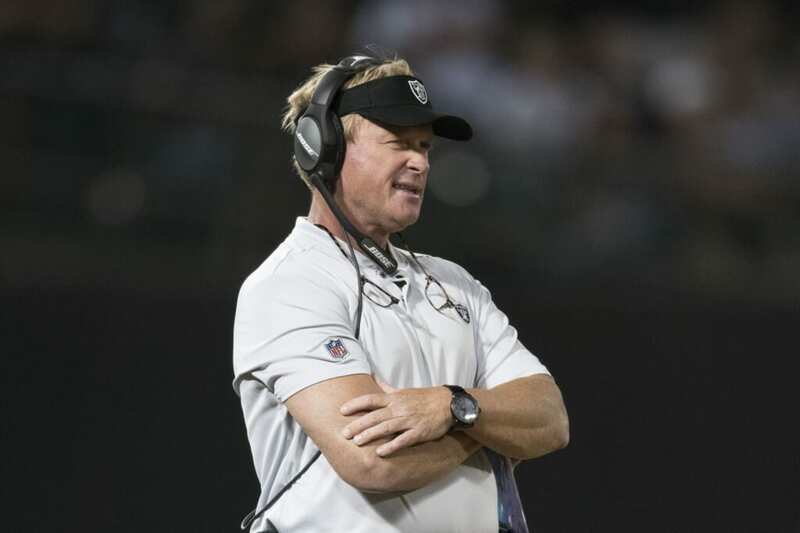 This trade, conducted under the umbrella of quasi general manager and head coach Jon Gruden, was as much about Gruden attempting to change the culture in Oakland than anything else. He noted immediately prior to the team’s Week 1 game that Mack didn’t want to be a member of the Raiders, primarily because the star pass rusher was holding out for a market-value contract. It’s a stance that simply made no real sense. Does this mean Aaron Donald didn’t want to be a member of the Rams before signing his record-breaking extension? No. It’s business. And Mack was vastly underpaid by the Raiders. Like clockwork, the Raiders missed their all-world defender in a 33-13 loss to Los Angeles Monday night. It’s a game that saw Oakland put up its worst pass-rush performance since before Mack was selected No. 5 overall back in 2014. 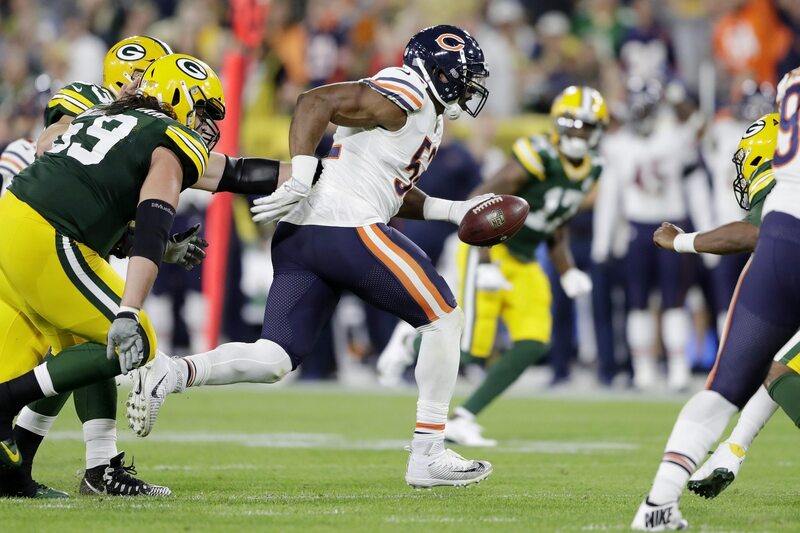 In his Bears debut the night before, Mack absolutely dominated. He recorded a sack, forced fumble, fumble recovery, interception and a touchdown. This led many around the football world to put both Gruden and the Raiders on blast. But what if we were to tell you that Mr. Gruden isn’t the real problem in Oakland? What if we were to tell you that the astonishing trade of Mack to the Windy City isn’t the real problem? Sure Oakland’s pass rush was non-existent against Jared Goff and Co. Monday night. That’s going to be a season-long issue. The larger problem? Derek Carr looks broke. The former Pro Bowler is nowhere near the quarterback we saw jump on to the scene in 2015 and 2016. Instead, he looks like a shell of his former self. This was just one of the three interceptions Carr threw in his 2018 regular season debut against the Rams. The quarterback’s final miscue came on a Marcus Peters pick-six to clinch the game for Los Angeles. It was bad. Really, really bad. 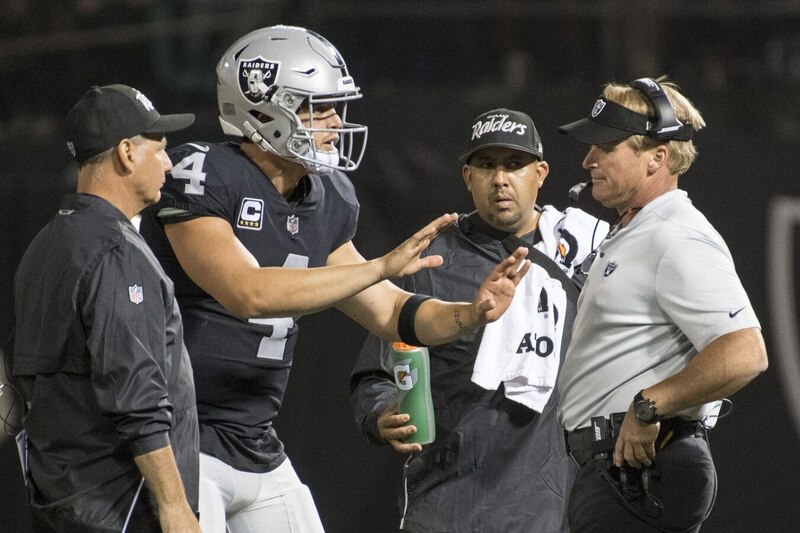 When the night was over in Oakland, Carr had completed 29-of-40 passes for 303 yards with zero touchdowns and three interceptions. On passes intended for actual wide receivers, Carr completed 5-of-9 passes with an average of 4.8 yards per attempt and a 28.7 quarterback rating. He was 1-of-3 on targets to No. 1 wide receiver Amari Cooper. These issues came along long before Oakland handed Gruden a 10-year contract. They’re what led to former head coach Jack Del Rio being fired one year after leading Oakland to a surprise playoff appearance. Let’s look at the Carr-to-Cooper connection as a prime example of longstanding problems with the Raiders’ offense. After putting up 155 receptions for 2,223 yards in his first two NFL seasons, Cooper was among the worst receivers in the NFL last year. All said, he caught 48-of-96 targets (50 percent catch rate) for 680 yards last season. A total of 335 of those yards came in two games. Outside of that, Cooper averaged less than 30 receiving yards per outing and put up single-digit yardage totals five times. These struggles are as much about Carr’s inability to get Cooper the ball as they are about the reciever’s high drop rate and issues getting separation. Monday night was a prime example of that. 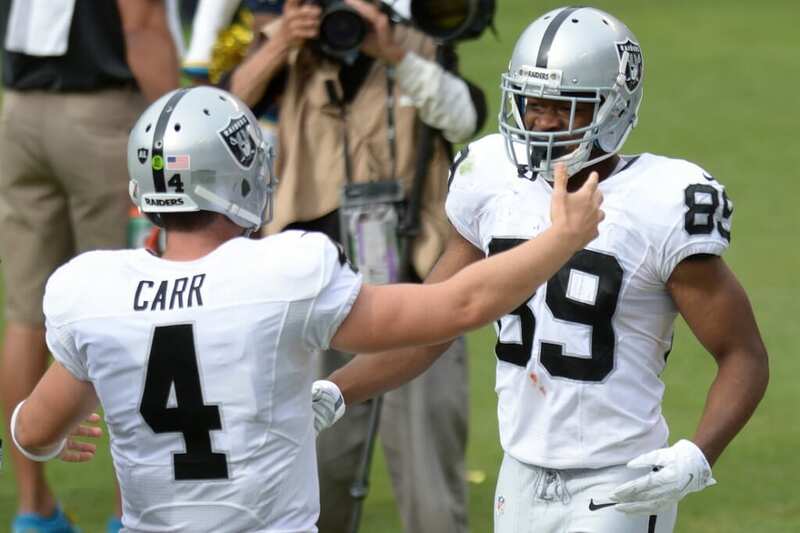 Carr targeted tight end Jared Cook and running back Jalen Richard a total of 23 times. Wide receivers? Well, they were thrown to a grand total of nine times. We can blame Gruden’s offensive scheme for this until we’re blue in the face. That doesn’t change the facts. Carr has struggled recently throwing to the outside. He doesn’t have confidence getting the ball to wide receivers. It’s something we’ve seen plague other young quarterbacks such as Marcus Mariota and Dak Prescott. But for Carr, it’s not limited to one game or the start of the 2018 season. Carr targeted running backs 102 times out of the backfield last season. That’s more than the 101 targets then-leading receiver and current Baltimore Ravens pass catcher Michael Crabtree saw. Oakland’s four-game losing streak to end last season was a prime example of this. Cooper was targeted an average of four times in his final four games. First, we were to blame then-offensive coordinator Todd Downing for the issues. Now, after one game, the blame is fully on Mr. Gruden? That makes absolutely no sense. And it’s one of those Week 1 overreactions that has come to define the NFL in recent days. This isn’t to say Gruden’s tenure won’t be a dumpster fire. In attempting to somehow change the culture in Oakland, he’s created an identity that’s foreign in the modern NFL. Deciding to move on from Pro Bowl punter Marquette King because of a personality rift was the first step in this process. King’s release came after the two had not even met in person. Think about that for a second. There was somehow a personality rift without the two guys knowing one another. That’s a spin worthy of the White House. Reality tells us that Gruden wasn’t happy about King’s showboating ways. The decision to release Michael Crabtree and replace him with a washed-up veteran in Jordy Nelson was another prime example of Gruden’s old-school ways. He wants grinders. Those who are team first. Apparently, King and Crabtree didn’t fit that mold. There’s no telling how this MO is going to play out moving forward. It didn’t start swimmingly Week 1 against a superior Rams team. But overreacting after one game while placing most of the onus on Gruden is simply unfair. Let this play out a bit more. And actually place some of the blame on the players who have proven unable to handle any scheme over the past year-plus. Yes, that includes franchise quarterback Derek Carr and a receiver in Amari Cooper who was previously anointed the second coming of Fred Fred Biletnikoff.